You don’t want to show up for golf looking like a complete newb! 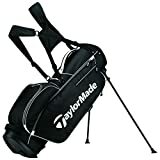 Having a good looking, functional golf bag will get your golf game headed in the right direction. 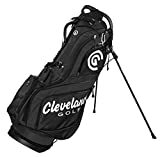 Some tips to keep in mind when buying a new golf bag. Look & Style – This sounds a bit obvious, but if you don’t like the look of your bag you won’t like it no matter how many pockets it has. Stand or legs – Depending on if you plan on walking or riding having stand legs may be very important to you. 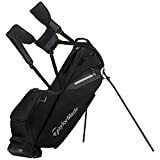 I always recommend a bag with legs as you don’t have to worry about it tipping over or laying your bag down on the ground next to the chipping green. Weight – If you plan on always riding you can go with a heavier bag, but I recommend using a bag that’s as light as you can get. Heavier bags wear on your shoulders. 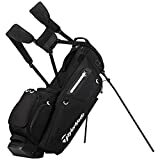 In addition, many bags offer a more “back pack” double strap which is much more comfortable than a single strap. Storage – I always recommend a bag with a bunch of pockets. Having a bag with good storage space is really nice. Especially, if you can find a bag with a sot pocket for storing your phone, GPS, etc. 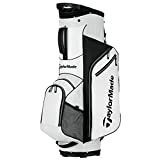 Below you will find our list of the best golf bags of 2019. 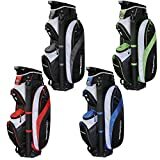 9 pockets(refer to images) including 2 full length for Apparel (each side), , 2 for valuables with velour-lined, and Insulated Cooler Pocket: 9 inches wide, 12 inches tall, 5 inches deep, it can hold 8 bottles of 12 oz cans plus 4 thin ice packs.